From High In The Sky: What's Hot. What's Not. Round Here. February. What's Hot. What's Not. Round Here. February. A bit of a round up for the shortest month. Yes, let's get the not-so-good out of the way first. RIP Gary the Magnificent. he was the very best of hamsters and he lived a good life; and last week we buried him behind the trampoline in a special box I'd been saving for an important occasion. It's not the same in the dining room without him. A dental crown falling out of my mouth and onto the street without any warning. Okay, so The (Not So) Small One scooped it up quickly and the dentist put it back in that afternoon., but, still..eugh.. The failure of the coffee machine after seven years. two weeks is a long time to wait for it to be fixed..
Bad pencil sharpeners. A very small thing, but surprisingly life un-enhancing, when every pencil in the house has a broken lead.. The beautiful bracelet and earring set I received from Lisa. I love it! Lisa blogs with honesty about the challenges life throws at her - I think I met her through Gotta Craft - and I always like to see an update pop into my Reader. You can see what she makes at A Little of What You Fancy. Very pretty! Little E, on his holidays. I believe that was pretty hot. The start of the Six Nations Rugby . Saturday afternoon. Big bag of crisps. Sorted. A short month and a busy one with ups and downs, highs and lows. We're looking forward to the lighter days now with a spring in our step. Come on in March! I'm keeping the pages in my round up series a bit roughed up and casual. I want them to look like an old cuttings book, a bit curled around the edges. This one has turned out pink and vintage, with flowers, which is exactly what Punky Scraps are looking for in their challenge this month. Handy! 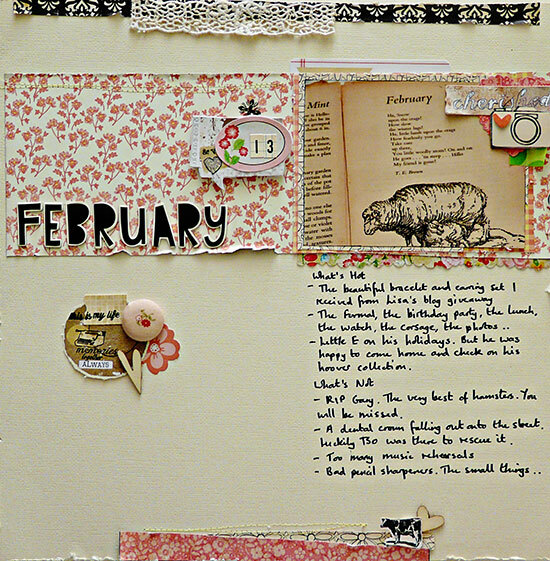 i love that idea for monthly layouts! shoudl do that to include in my PL!! also, love your layout! 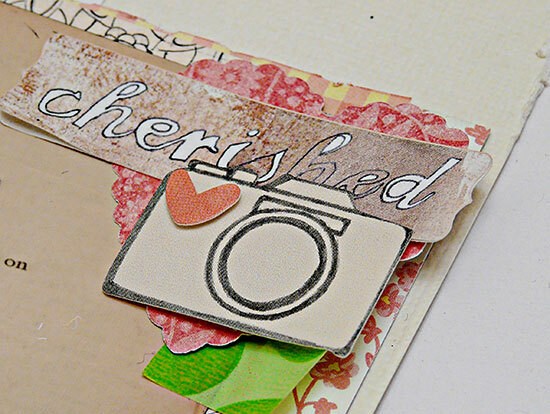 the papers are so pretty and "different" from everything else we see, are they "vintage"? Congratulations on the Uni placement. I love your page, the colours and feel of it really appeal to me. SYS! Sorry about Gary the Magnificent. :( Maybe try a critter with a longer life span next? And congrats to TTO! All things considered I'd say you had a month to be grateful for. Congrats to the university bound son - it is always a relief to get the first acceptance to college but a real joy to get the one that they really wanted! Well done Tall One! Such wonderful news. Love the LO. Love your idea for the post (as always). Thanks for the reminder about the rugby! Know what I'll be doing tomorrow morning! Alinor, you are right - it's older paper I pulled from a two year old Midnight Rooster kit. I think it's MME? Congrats on the university placement! I've got the best precious this month for a story. I'm just hoping I get the photos edited today so I can write it up tomorrow. I was only lamenting the plight of ridiculously made pencil sharpeners last week - they are so frustrating! My condolences to you all over the loss of Gary. A very pretty page, Sisn, and I like the roughed up look.. Your inspiring blog has been warmly mentioned over over here at the Bloggers' Weekend, and am sending you warmest good wishes from us all. I got home tonight and suddenly realised that it is STS THIS Sunday (ie. TOMORROW!). Where did Feb go????? My story might be late unless I get time tomorrow morning but I am looking forward to everyone elses. Looking forward to Storytelling Sunday. I had to plan ahead because I have way too much on my plate right now!! Congrats to TTO, so exciting when they are accepted at their top choice. Will that be far from you? But your "hots" all sound so wonderful. I'm working on my Irish+ One Precious story right now. I love the monthly round-ups. So sorry to hear about Gary the Magnificent's demise. The loss of a pet is never easy. And Congrats! to the Tall One. It's wonderful to be accepted at your top choice. Absolutely love that last photo and cluster, memories always made me smile. wow!! your layout is fabulous! and i love this "whats hot, what's not round up." such a neat idea. sorry about the hamster...but great news about your son! So sorry about Gary and the dental crown. Thankfully, it sounds like the good outweighs the bad for February. And March, being that much closer to spring, has got to be better! A lovely round up of your month! 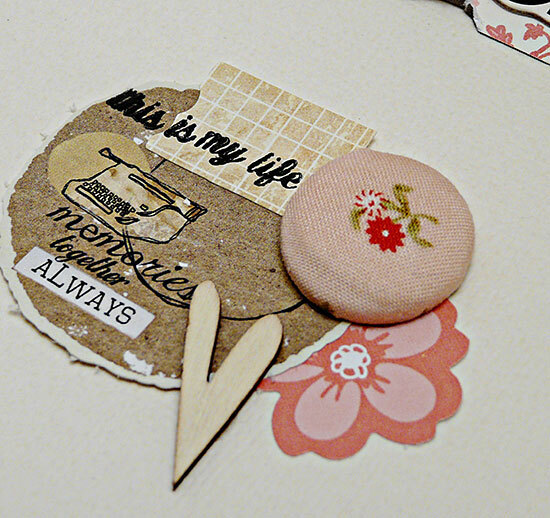 My February was ups and down, too - I'll be sharing my Art Journal page about it this week. I kind of just love this page. Thanks for playing with Punky Scraps.